You’ll only think about baby monitors at two distinct periods in your kid’s life. The first is when they’re infants and you’re understandably nervous about leaving your fragile baby alone. The second is when they’re toddlers and have finally discovered how much more mischief can be achieved with legs. Fortunately, monitors, like Motorola baby monitors, have evolved to keep up with even the second stage. 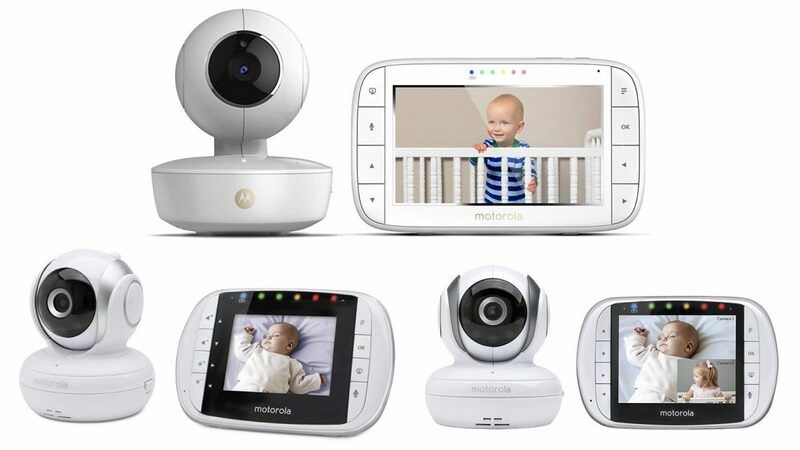 Here is the detailed review of the best video baby monitors from Motorola. This Motorola baby monitor mbps36s comes with a 3.5 display screen for crystal clear imagery both during the day and night time. To fully appreciate the screen size, know that some monitors come with 1.8″ screens as if you’re expected to squint and view just one body part at a time. The 3.5″ screen is almost like viewing through an iPhone screen, so you can see more. A feature you’ll find very handy is the two-way communication channel. So you can hear your baby and also be heard, meaning you can console your baby from afar within the extra seconds or minutes it will take you to get to the crib. You can also pan, zoom in and tilt the camera so you can see what the fuss is. While the package comes with just the one camera, it allows you to connect 3 more, in other rooms if you prefer. You’d have to buy the other cameras separately of course. But at least, you’ll have a monitor at hand when your baby begins moving throughout your house. Although the camera allows for perfect vision when the camera is up to 9 ft from the baby, you should move it a bit closer at night. This is because night vision displays images in black and white, so you might not be able to differentiate certain features well from afar. Remember parents use baby monitors more at night. Room for expanding monitored areas (buying more cameras instead of more monitors). Short battery life when the video display is been used (3.5 hours on the pack can end up being just 1 hr 40 mins and even less). Shorter range than the 590 ft advertised. It has only about 100 ft range, but apparently, that’s because there are a lot of walls between the Motorola baby monitor and the parent’s display. While this checks in as fairly average on the baby monitor market, the large parent display screen makes it a more outstanding buy than many of its counterparts. Especially ones that come without the parent display. Alright to fully understand this Motorola baby monitors mbp33s, you’ll need to compare it with the mbp36s. What’s missing in the previous review is the price range of the Motorola baby monitor mbp36s (over a hundred dollars). If you’re on a budget, the mbp33s is a more suitable alternative, since it’s under a hundred dollars. So what features will you be compromising on with a cheaper monitor? For starters, your parent display will be a tad bit smaller, at 2.8″. Note that this is still bigger than 1.8″ screens. But it’s still kinda small. Fortunately, you can bypass this. There’s a third party app, Hubble, which allows you to link your Motorola baby monitor to the app, and then you can view your baby from either a smartphone or tablet. Of course, this is slightly more invasive than most parents want since Hubble will likely store some of your private data. It also doesn’t have the pan and tilt setting on the mbp36s. It does still come with the temperature sensors, 2-way channel with volume control, and sadly, the same limited range as the mbp36s, which can be shorter than the 590 ft advertised. You can also connect several aftermarket cameras and view your kid in split screens so there’s that. Since the screen is a bit small, and you’re on a budget, you can keep your own parent’s unit zoomed in. This way, you’re likely to notice even the slightest changes without having to squint. Using Hubble might infringe on your privacy. And most users give the app a low rating anyhow so you’ll end up being stuck with the small screen. Monitoring your baby doesn’t have to be costly. 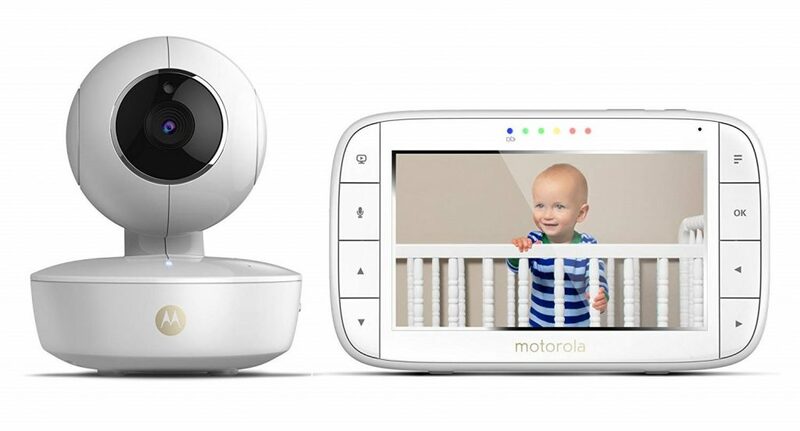 So this Motorola baby monitor is perfect if you’re on a budget. Again, reviewing this monitor will make way more sense when compared with the mbp36s. Mbp36xl is an upgrade so be prepared to be awed by the changes. Alright, the basic upgrades are; an increased microphone sensitivity to detect the smallest disturbance and a camera that doesn’t need to be plugged-in to work. Most people had to rearrange the whole baby room to find a spot that had a plug whose position won’t cause a person to trip on the cord at night. They didn’t really complain cause it’s an industry-wide problem. So this upgrade is most welcome. Now for the good stuff. Motorola made the screen 5 inches! It’s basically watching your baby from a small tablet. They also increased the range from 590 feet to 1000 feet. So even with walls, you can be sure of having up to 200 ft before it beeps out of range. It also comes with 5 lullabies for nights you’re too tired to sing. Remember that Motorola baby monitors give a better range if you live in an open house, i.e. not a lot of walls. So if your home is big, and has lots of walls, you shouldn’t stray too far from the camera. Biggest parent display screen by Motorola as at now. It’s the most expensive Motorola baby monitor on this list. Mbp36xl literally solves the customer complaints associated with the other two motors. So if you’re willing to splurge a bit, this is your monitor. To sum up, baby monitors tend to be pretty standard. But as the end goal is for your peace of mind, you should take note of the parent-centered features in Motorola baby monitors that make them stand out from their counterparts.